It’s no surprise that things tend to slow down and lag when we age – metabolism and energy levels just to name a few. Another process that slows down is our body’s ability to maintain healthy levels of hyaluronic acid. 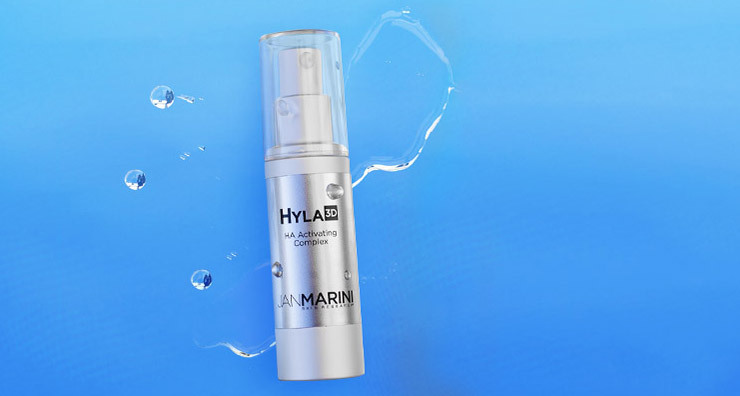 The new Jan Marini Hyla3D is formulated to restore this loss resulting in more hydrated, youthful and beautiful skin. Why you need it: Our body naturally creates hyaluronic acid, a substance that holds up to one thousand times its weight in water, and up to 50% of it is found in the skin. As we age, our body creates less and less hyaluronic acid resulting in dryness, loss of firmness, fine lines and wrinkles. To replenish moisture levels in the skin, a topical hyaluronic acid product is needed. What it does: Hyla3D contains multiple forms of hyaluronic acid including liposomal encapsulated HA, cross-linked HA and ultra-low molecular weight HA. The formula takes a three-dimensional approach to restoring moisture and volume to the skin. It not only boosts hydration on the surface, it also enhances the natural hyaluronic acid in your skin to help fill in the appearance of fine lines and wrinkles. Hyla3D also contains antioxidants to defend against free radical damage and peptides to boost collagen and elastin. Who it’s for: Unlike traditional moisturizers, Hyla3D comes in a lightweight serum formulation so it is ideal for all skin types including normal, dry and oily. This serum is also ideal for anyone who has sensitive skin or is acne-prone. You can apply Jan Marini Hyla3D morning and night to the entire face and neck area. Have you ever tried a hyaluronic acid product? Share with us on Facebook, Twitter or Instagram using #LovelySkin.